For over 50 years, Sturdico has provided quality tax products to tax professionals. Our products are designed to help organize your clients and make your job easier and more profitable at tax time. Our products help you retain existing clients and acquire new ones, by distinguishing and highlighting the importance of your professional tax service. Sturdico was founded in 1962, by Roy Sturdivant. Working as a public accountant in San Diego, CA, Roy grew weary of clients bringing in boxes, sometimes even drawers of receipts at tax time. He spent long hours sifting through their mess to categorize into income and deductions in order to prepare their personal tax returns. One day, he thought, there needs to be a better way to get his clients organized and make the process more efficient. The answer came in Roy's invention of the Income Tax Organizer and Deduction Finder. A small booklet that accountants could give to their clients at year end. With the help of a loan from his father-in-law, Roy manufactured, advertised and sold the booklets via the mail. This was the first of its kind and revolutionary in the accounting world. Possibly during the past tax season, our clients have come in with boxes or bags of invoices, information in various forms, incomplete information, all necessitating a lengthy interview. This situation can be improved. The Tax Organizer is professional in appearance and concept. Designed to reach no conclusions in itself, but to provide the professional tax preparer with pertinent information in an orderly fashion. Edited annually, the Income Tax Organizer and Deduction Finder is a current, up to date publication. 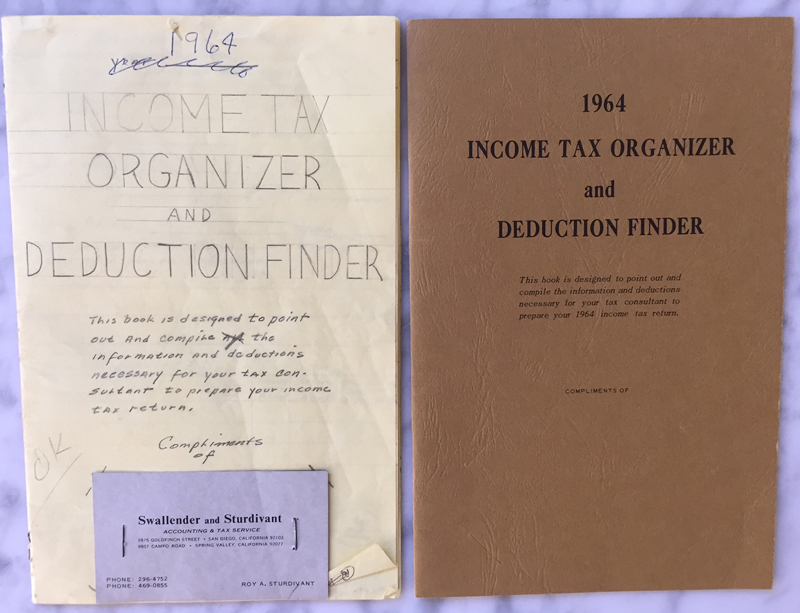 With the success of the Tax Organizer, Roy expanded Sturdico to include other new types of handy tax products - envelopes for filing and storing tax returns, mailing envelopes to mail tax returns, data collection envelopes for storing receipts and invoices. Sturdico's slogan became "Time to get organized!" , along with a new clock displayed in the catalog each year. In 2011, at the age of 84, Roy turned over the day to day operations to his daughter, Cathy. Sturdico remained a family run organization and Roy continued to advise on the business and take telephone orders from his loyal customers until 2016. This year we are pleased to announce faster service for our customers! Our goal is to ship non-imprinted orders within 3 days and imprinted orders within 5 days. In June of this year, we moved our printing and fulfillment operations in order to provide faster and improved service while maintaining our low prices. We teamed with a large print and mail company whose mission aligns with those of Sturdico - to provide high quality/low cost tax products to our customers that are printed accurately and delivered on time. We are still a family owned and run business, so you can expect to receive the same friendly and helpful service you have received for over 50 years! We look forward to fulfilling your tax product needs and to a successful and prosperous tax season! Thank you for visiting the sturdico website!